Marijuana SEO is the mean for your cannabis-related business to gain visibility, organic traffic and drive new customer acquisition. Having the right Marijuana SEO strategy for your website, dispensary, brand or product will help you grow your business. Following the recent changes of laws and regulations in many countries related to both Medical and Recreational uses of Marijuana, the Marijuana industry is currently growing at an exponential rate! The data forecast for the US market only for the next 7 years is enormous. The European countries will also surely be following this trend in the near future! 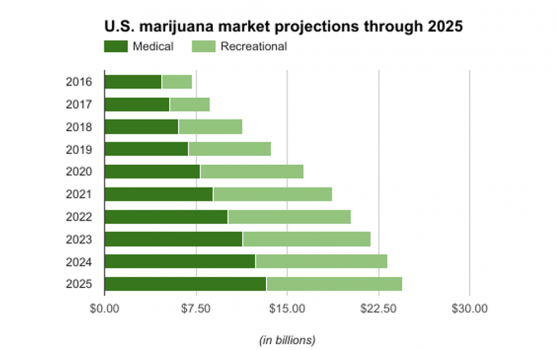 The graph above is clearly showing the amazing increase in the marijuana market size in the USA. In the next 2 years, this industry will already represents more than 15 billion dollars in the US only! Globally speaking, the same trend is visible: countries in Latin American and Europe are increasingly adopting medical cannabis programs. Germany is also considering recreational legalisation within the next years. The Marijuana industry will be a main factor of national growth for the countries embrasing it for both medical and recreational uses. As countries begin to legalize regulations related to this drug, the market is expected to witness a surge in demand. Currently, a majority of the cannabis is sold through illicit channels. To curb this black market trade, governments have started legalizing marijuana in order to monitor the products that enter the supply chain and gain benefits through taxes collections on these products. As Cannabis legalization is spreading rapidly across many countries, competition within the Cannabis industry is getting tougher. Hopefully, Marijuana SEO is here to help your brand and business! 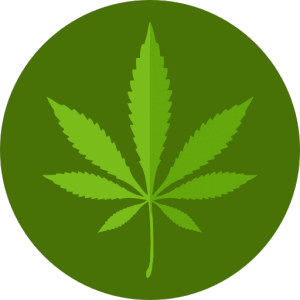 Our Marijuana SEO service was specifically created to reply to your cannabis SEO needs! It follows all the main SEO requirements from Google (and other search engines) and apply them to your marijuana-related business. This will help you rank your website as high as possible in the search engine results pages for the main marijuana search terms important to your business. The main and final goal of Marijuana SEO is to bring visibility and additional traffic to your cannabis website to increase your ROI and brand awareness. Reasons why Marijuana SEO is essential? Canada will legalize recreational marijuana in full in October 2018. Growers will need to get licensed by the government, and individual provinces can determine how the product gets sold and distributed. The government will not, however, advertise nor promote anything related to Marijuana. Together with some USA states where recreational marijuana is also legal, the doors are open for a “weed race”, as companies jump into this new amazing market, full of growth possibilities. At the moment there are already several public companies in the stock market and others will follow in the next years. This marijuana race is creating a very competitive market in which players will need to stand out and fight for the top places in Google, as users and other B2B companies start searching more and more for market and investment opportunities. This is especially true as it is not (yet) allowed to do any kind of paid advertising related to both medical (medicines) and recreational use. In fact, such as for cryptocurrency advertising or adult industry, promoting any kind of marijuana-related business on social media or search engines is not permitted. Additionally, other side markets (like seeds, accessories, transformed products, etc.) will also flourish, once consumers start to produce at home without the risk of going to jail. More competition will come into the marijuana market soon and companies will have to adapt and fight online to stay on top. The long-term solution to this situation is obviously Search Engine Optimization to gain organic traffic and visibility. Marijuana SEO is now a basic necessity for all companies in the weed-related industry and UniK SEO is here to provide especially focused SEO services in Marijuana promotion and advertising. 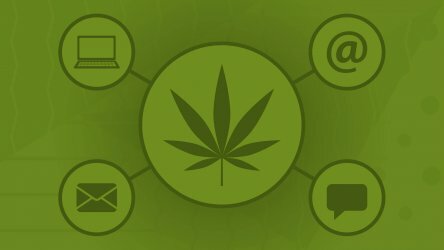 How will we help you with Marijuana SEO? The first necessary step of any successful weed-related business is to understand the keywords of your target audience uses when they are searching for the products or services. We know in detail how marijuana-related keywords work with consumers and companies. We create, update and optimize your product or service pages to appeal to customers and search engines. Your marijuana-related website contents will need to represent relevant marijuana keywords related to what you are selling online. How your local Marijuana dispensary is indexed and ranked on the search engines is a fundamental SEO consideration! We will help you to bring local customers and online searchers using Marijuana related keywords and terms to your cannabis store not only online but also physically! This is the most effective way to get authority and marijuana-related SEO rankings. We build your backlink profile to increase your marijuana website popularity and achieve better rankings. Through extensive experience in the weed industry, we know where to obtain better results and what works for your cannabusiness. Contact us about your Marijuana SEO? We are here to help you discover the full potential of your marijuana business whether you have a local cannabis dispensary or a new marijuana brand or product to launch. Don't hesitate to get in touch to talk about the cannabis industry and how to market/advertise your product.